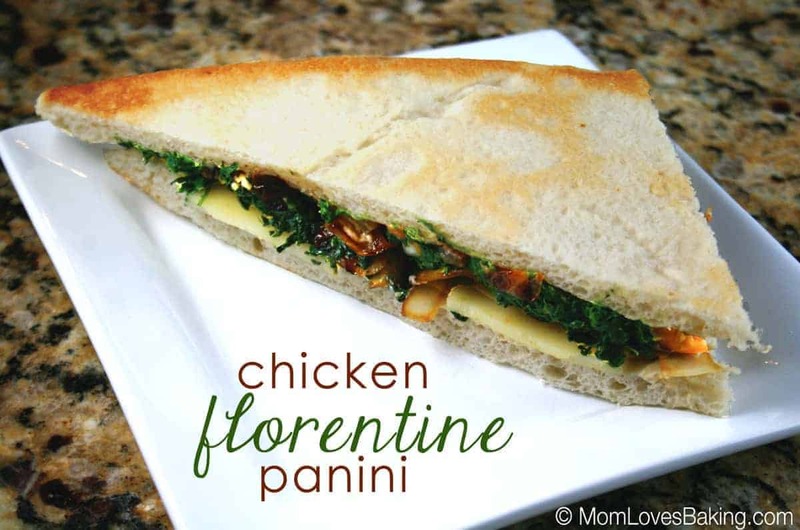 Chicken Florentine Panini won the 40th Pillsbury Bake-Off in 2002. Recipe on Pillsbury.com by Denise JoAnne Yennie of Nashville, Tennessee. 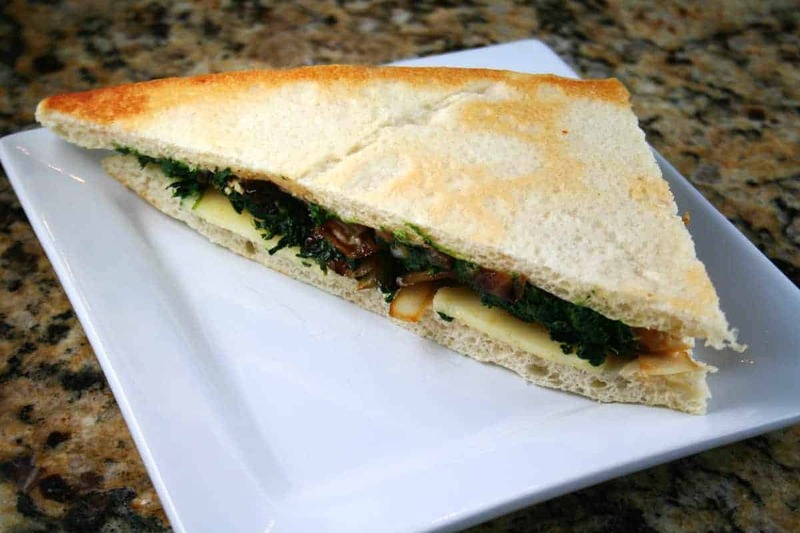 Baked pizza dough is the bread for this healthy and delicious sandwich. First you bake the dough at 375°F. for 10 minutes. Meanwhile, cook and drain the spinach. Set aside. 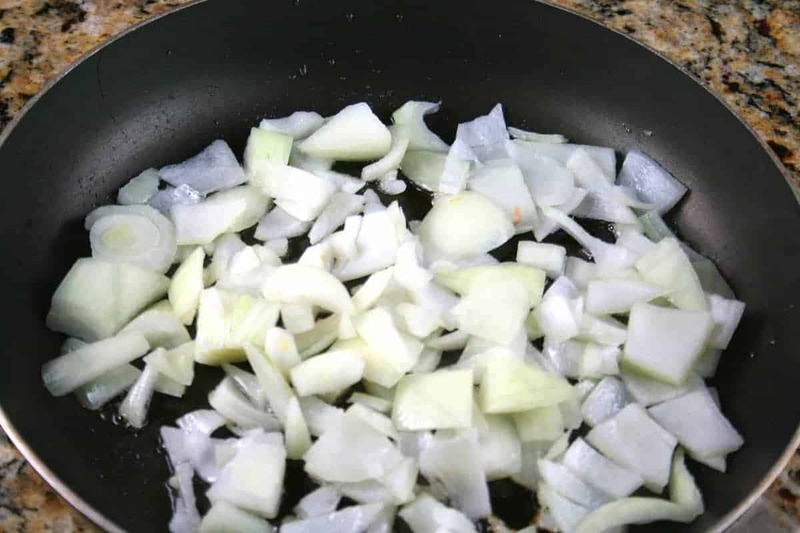 Then saute the onions. (Recipe calls for red onions but I didn’t have any.) Add sugar and vinegar. Reduce heat and simmer a few minutes or until most of liquid has evaporated, stirring occasionally. Pound the chicken until it’s nice and thin. Spray large skillet with nonstick cooking spray. Heat over medium-high heat until hot. Add chicken; cook 8 minutes or until browned, fork-tender and juices run clear, turning once. Cut the bread into 4 pieces and spread with a mixture of mayonnaise and minced garlic. Put a slice of cheese on each slice of bread. Add chicken, spinach and onions to 2 of the slices. 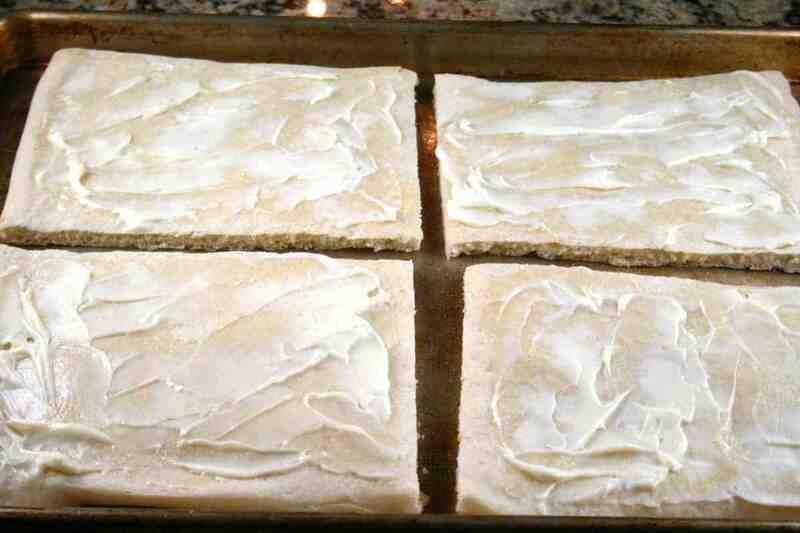 Place remaining bread slices on top. You will have 2 large sandwiches. Heat sandwiches for a few minutes in a medium skillet on medium heat. Cut the sandwiches in half diagonally and serve. 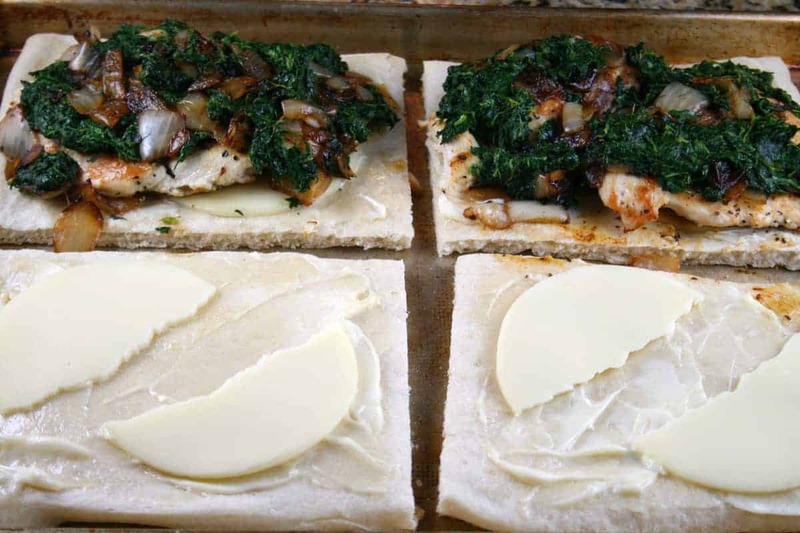 With the sweet and sour onions, garlic mayo, cheese, spinach and chicken, this panini packs a lot of flavor in between the pizza dough flatbread. Superb! Heat oven to 375°F. 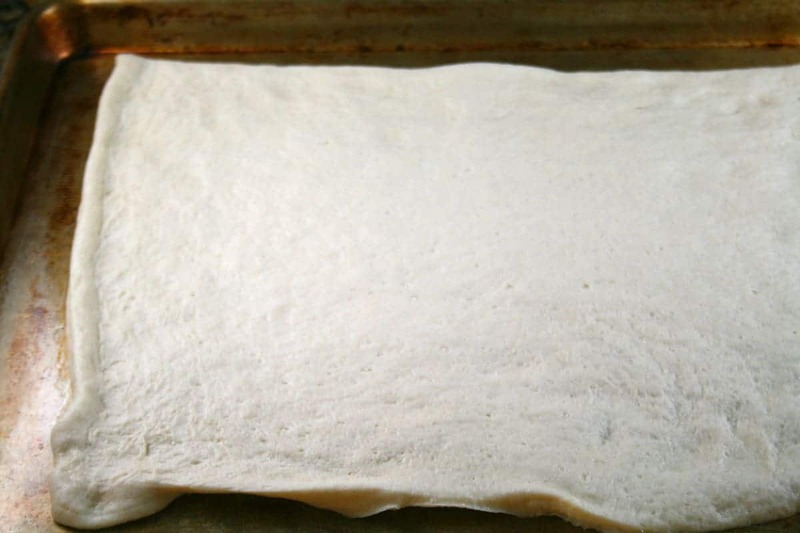 Unroll dough; place in ungreased 15x10x1-inch baking pan. Starting at center, press out dough to edges of pan. Bake at 375°F. for 10 minutes. Cool 15 minutes or until completely cooled. Meanwhile, cook spinach as directed on package. Drain well; squeeze dry with paper towels. In small bowl, combine mayonnaise and 1 of the garlic cloves; mix well. Refrigerate. 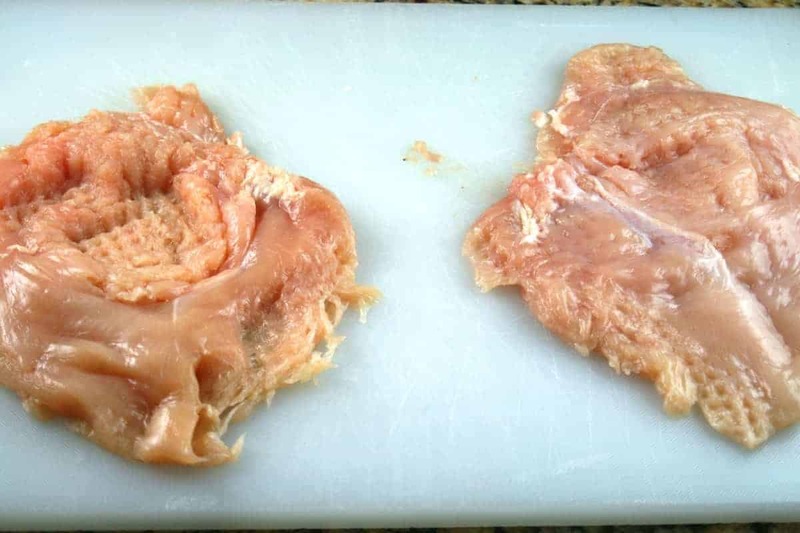 To flatten each chicken breast half, place, boned side up, between 2 pieces of plastic wrap or waxed paper. Working from center, gently pound chicken with flat side of meat mallet or rolling pin until about 1/4 inch thick; remove wrap. Sprinkle chicken with Italian seasoning and minced garlic. Spray large skillet with nonstick cooking spray. Heat over medium-high heat until hot. Add chicken; cook 8 minutes or until browned, fork-tender and juices run clear, turning once. Heat large skillet or cast iron skillet over medium heat until hot. Place sandwiches in skillet. 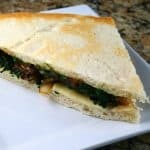 Place smaller skillet on sandwiches to flatten slightly. Cook about 1 to 2 minutes or until crisp and heated, turning once. Cut each warm sandwich into quarters.